What Are American Coins Made Out Of? 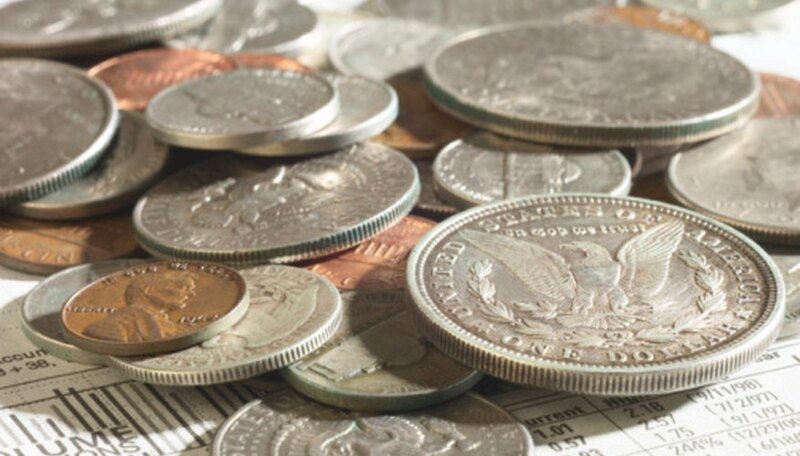 Throughout the history of the U.S., coins have been made out of a wide variety of different metals. Initially, coins had to be made out of precious metals that were roughly worth the face value of the coins; however, with the evolution of American and worldwide economics coupled with the skyrocketing prices of certain metals, this is no longer the case. Since 1961, U.S. pennies have been made solely out of copper-plated zinc. The initial composition was 95 percent copper and 5 percent zinc, but the amount of zinc was lowered to 2.5 percent in 1982. Before 1961, pennies also contained a small amount of tin in addition to zinc and copper. As of 2011, American nickels, dimes, quarters and half dollars are all minted with cupro-nickle. Cupro-nickel simply means that a coin is made out of a combination of copper and nickel. The five-cent piece is composed of 25 percent nickel to 75 percent copper, while the other three cupro-nickel coins (often called clad coins) are made with 8.33 percent nickel and 91.67 percent copper. Eisenhower dollars were also minted with this same clad composition. The modern Native American and presidential one dollar coins are made out of a copper, zinc, manganese and nickel combination known as manganese-brass. Although these coins are gold in appearance, they have no actual gold content whatsoever. The complete composition of these coins is 88.5 percent copper, 6 percent zinc, 3.5 percent manganese and 2 percent nickel. No circulating U.S. coins are minted with any silver as of 2011. Historically, however, three-cent pieces, half dimes (the predecessor to the modern nickel), dimes, 20-cent pieces, quarters, half dollars and silver dollars were all minted primarily with silver, usually with around a 90 percent silver to 10 percent copper metal ratio. Every year, the U.S. mint produces a limited number of silver bullion coins and special silver coin sets specifically for coin collectors and investors. As with silver coins, gold is not currently used in the composition of any circulation currency. Also like silver coins, the U.S. mint produces gold bullion and collector's coins every year. Historically, gold was used to mint coins with greater face values than those of silver. In the era before paper money, gold was used to mint $1 coins, $2.50 coins, $3 coins, the short-lived $4 coins, $5 coins, $10 coins and $20 coins. Most of these coins were minted with about 90 percent gold to about 10 percent copper. What Are My Old Silver Coins Worth? How Much Is a Liberty 1942 Dime Worth?